On their way to the next meeting, (from left to right) Gallia Assistant Engineer Beth Lozier, Gallia Engineer Brett Boothe, Community Improvement Corporation of Gallia County President Josh Bodimer and CIC member Tammy Brabahm, visit Washington DC to discuss Gallia’s hopes to attain federal grants for a smart corridor project. 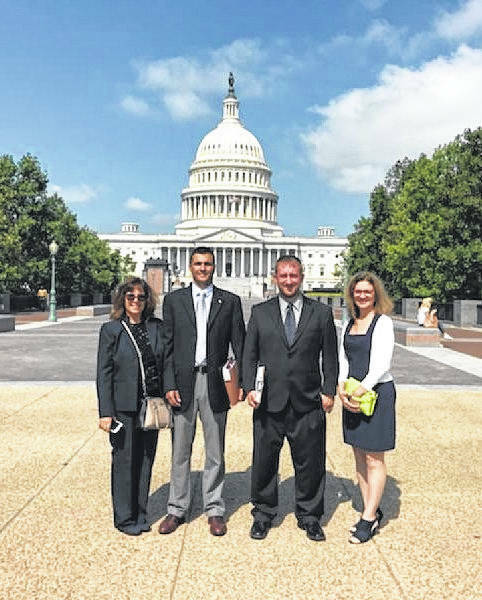 WASHINGTON DC — Members of the Community Improvement Corporation of Gallia County met in Washington DC Thursday to discuss hopes for placing a smart corridor through Gallia and paving the rest of its gravel county roads. Gallia Engineer Brett Boothe first approached the Gallia Commissioners in mid-July and then Gallipolis City Commissioners the next week about a pair of federal grant applications totaling around $50 million in awarded money to bring to Gallia’s economy, if approved by federal officials. He, Gallia Assistant Engineer Beth Lozier, Community Improvement Corporation of Gallia County President Josh Bodimer and CIC member Tammy Brabahm visited with Ohio’s sixth District Congressman Bill Johnson, US Senator Sherrod Brown’s staff, US Senator Rob Portman and senior officials with the US Department of Transportation to share the importance of the projects to Appalachia and the southeastern Ohio region. Boothe said the group first met with Congressman Johnson, then Senator Brown’s Office, senior officials from the USDOT and then with Senator Portman. Boothe said Johnson has written a letter of support for both projects. Johnson’s official Twitter account has shared a Gallipolis Daily Tribune article also voicing support for the projects. The projects also received letters of support from Brown and Portman, said Boothe. “This meeting with all these people, the congressman, the senator and officials, we want to make sure that, number one, we’ve turned in great applications. We know that. Our main priority was also to reach out to them and put those projects in the spotlight to hopefully gain additional influence to have a chance at getting one of these projects in Gallia County, if not both,” said Boothe. The officials with the US Department of Transportation, the engineer said, were part of senior staff who received the Gallia grant applications. Boothe was confident with his conversations that he felt Washington officials felt both projects had good “cost benefit analysis” and would be a boon to the region’s development. While aiming to pave over 100 miles of gravel and dirt county roads is certainly one of Boothe’s main goals as Gallia County Engineer, the creation of a potential smart corridor in Gallia County could place it in a position to serve as a leader in testing smart driving technology in Appalachia. US 35 serves as a major gateway of commerce, connecting Ohio to West Virginia and provides access to several states on the east coast. Boothe’s grant proposals, however, are competing among 800 other BUILD program applications nationwide. Previously titled the TIGER program, since its inception, Boothe said no BUILD program grants have been approved in 32 counties in the Appalachian area throughout Ohio. Grant funding for programs had previously been awarded in Hamilton, Pickaway, Summit, Portage and Cuyahoga Counties. Boothe thanked CIC for making the trip to Washington DC possible as well as his staff for their work and project supporters for their enthusiasm. For more information, visit www.galliabuildgrants.com.